It was another busy week for our media talent covering Premier League & Champions League Football for worldwide broadcaster clients including BBC, Sky Sports & BT Sport. 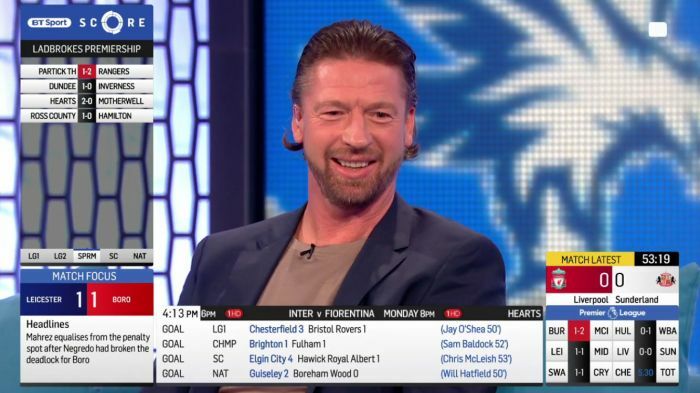 Former German International Steffen Freund made his debut for BT Sport as a guest panellist on The Score Show, while Ex Celtic Manager Neil Lennon was a studio guest for the live Celtic v Barcelona Champions League game at Celtic Park. Danny Mills, Kevin Campbell and Chris Kirkland were all in the Sky Sports News studios for the morning Premier League Daily shows, and Chris then made his debut on Sky Poker, taking on the pros! Former Leicester City Captain Matt Elliott was once again the guest on BBC World Football Focus show, and on Saturday Ex England Goalkeeper Chris Kirkland made his first appearance on BBC World Service Radio covering the days Premier League games. Former England striker and now Derby County hitman Darren Bent was back in the Premier League TV studio for Wednesday's Football Today and Fanzone shows. Premier League Winner Chris Sutton was over in Dublin for EirSport covering Thursday nights live Europa League games for the Irish Broadcaster.